Those of us who work day-to-day in apparel often forget what ‘fashion’ is like for people not in the industry. We forget, if we ever knew, that industry outsiders may not understand that there are always very real drivers and impetus to how fashion happens. We look back as much as we look forward, and we analyze fashion trends and fashion disasters. A critical difference, however, is fashion designers speak a language with vocabulary composed of color, shape, style, and form. Our stylistic judgments are made, and we begin talking about what we think will be ‘important’. Others in the industry ‘get it’. We don’t have to say much more than we ‘believe in it’ and we ‘think it is important’ and discussions then become very tactical to get the idea developed into a product. Using that language to outsiders is akin to American tourists traveling in a non-English-speaking country. We speak louder in the hopes that our audience will understand what we’re trying to say. Sometimes, through a common hook, we’re able to communicate. But usually the experience is a handful of apparel industry personnel discussing whatever new concept excites them while the industry outsider tries to keep up by tossing in bits of wisdom they gleaned at Style.com or one of the other fashion web sites. Attending the Japan Fashion Now exhibit at the FIT Museum had additional interest to us beyond being exposed to the latest in fashion development out of Japan. We were joined on this expedition by one of our colleagues at IBM, Aimee Sousa, who likes aspects of fashion (in particular boots), but she isn’t steeped in Fashion. And it was very interesting to us to watch Aimee’s first experience at an event that was very focused at apparel industry practitioners. With the exception of the guests, the invitees were industry personnel and FIT alumni. The presenter was Valerie Steele, a world-renowned fashion historian and thought leader in her space. The language was our language, and Ms. Steele was presenting to us in our mutually-understood language. It would not have been unlikely that the conversation that evening would have been not accessible to an industry outsider, and that she might have been less than captivated by the experience. Instead, we had an opportunity to watch as the magic, romance, and passion of our industry, our product, our drive, was distilled and communicated in such a way as to captivate our colleague. As we rewound the exhibit later that evening at a cocktail function, it was deeply satisfying and interesting to learn how after years of buying off-the-rack, our colleague suddenly ‘got’ that fashion has reasons for design and that we designers do not create in a void. Rather, we are looking backwards at the past, while predicting the future, and living in the present. Some of our best resources are still museums and old fashion periodicals, and our best guides are fashion historians and other designers, but at the same time we have also learned to use the many new digital resources available to us. Watching Aimee’s induction into our language was a curious experience. She is still not immersed in the flow of our world, but she understands better now why we say brown is important, or we believe in cheetah (or denim, or silver, or whatever). The experience also brought home to me again how tribal our fashion choices are, and how we choose to adorn our bodies is critical to reflecting our beliefs, our alignments, even in some cases our emotional state. A critical question asked of me prior to the event was ‘what shall I wear?’ Naturally, the answer was ‘black’. But that answer this set off a whole additional round of questioning: should I wear a dress, what about shoes, what sort of accessories? My guest wanted desperately to align with our mores, to appear as an outsider at this very insider event. She choose to do this by the clothing she selected to wear to the event, just like she chooses to align her avatar in virtual worlds with the different communities she belongs to. There has been a rise of interest lately by corporations and educational organizations in providing attractive avatars for their virtual world projects. this is not really a surprise to us in the Fashion Research Institute. We have, after all, been researching the process of immersion and how people adapt their digital avatar representation with new ‘tribes’ or communities in digital spaces. Moreover, as we were reminded recently at our fashion event at FIT in New York City, people’s desire to align with communities is a transcendent force. Just like in the physical world where my colleague was flustered until we sorted out the o-so-important question of ‘proper dress’, so too in virtual worlds are people unable to focus on actual work and deeply immerse until they create a visual representation of themselves which they regard as acceptable. Admittance to a group whether in the physical world or the digital realm is as close as adorning your avatar with the right clothing and accessories. Acceptance, of course, requires rather more time for other community members to learn about who the person is. But that initial tentative acceptance is lubricated by the strong visual cues created by the choices an avatar owner makes in dressing and customizing their avatar. We saw this over and over again when we operated our official Linden Lab® Community Gateway region in Second Life®. 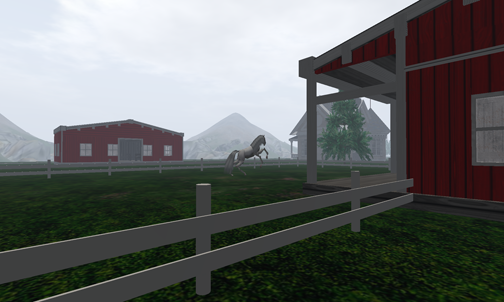 After orienting and observing more than 65,000 new users of Second Life, we have good data on how to get new users quickly oriented to these new tools, and how they learn to immerse. Needless to say, we were so delighted to be joined by our colleague at the Japan Fashion Now exhibit. Not only was the fashion fashionable and the company wonderful, but we were pleased to have a learning moment in our area of research. Fashion Research Institute CEO Shenlei Winkler will be speaking Friday, December 11, at 1 pm ET at a MICA Professional Seminar in Second Life. The title of the talk is: Towards the Future: A Foundation to Support OpenSim in Education, Science, and Research. Fashion Research Institute has been working in OpenSim since Fall 2007. 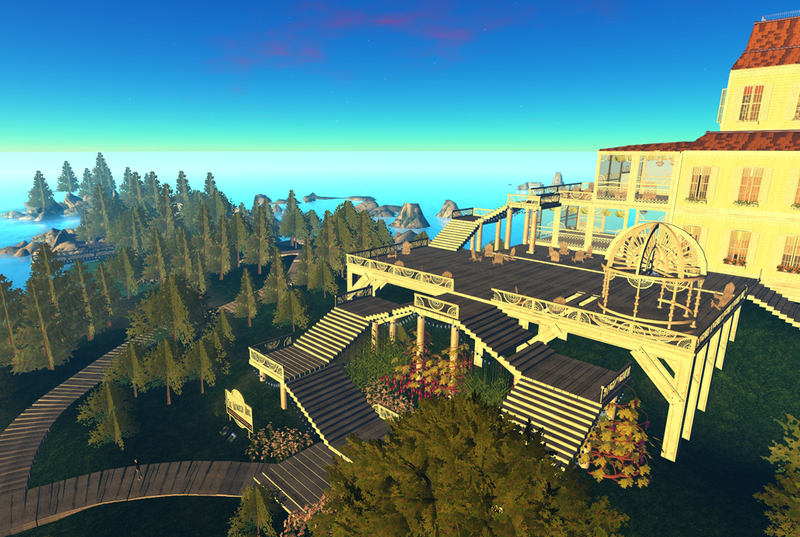 Winkler developed the well-known Shengri La Spirit region, the first OpenSim region that broke the artificially imposed prim limit of Linden Lab’s Second Life platform. Shengri La Spirit is currently hosted on hardware provided by Intel Labs, and is available for the interested public to freely visit in the ScienceSim grid. The ScienceSim grid is hosted by IEEE and ACM, and it was created as a presentation grid for Supercomputing 09. ScienceSim itself is the result of multidisciplinary teams of collaborators working on various educational, scientific and data visualization projects. The efforts of the teams working on and in ScienceSim has left a lasting impression on the OpenSim code base, with multiple performance code patches contributed to the code base. In tackling the challenges of preparing the various projects being developed on ScienceSim, the collaborators also created a rich repository of data and knowledge. 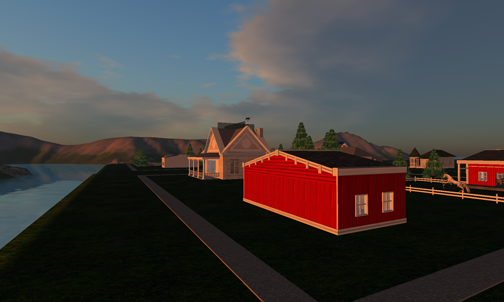 This repository offers appreciable insights into using the OpenSim platform for an array of educational, scientific, and research purposes, and it should be used and built upon to create offerings that other educators, researchers, and scientists can use as they expand onto this platform. It is from this basis that the proposal was made to develop a formal foundation to support OpenSim for use by educators, researchers and scientists. Please join us on Friday, December 11th at 10 am PT/1 PM ET in Stella Nova in Second Life for this initial proposal of a foundation to support OpenSim in education, science, and research. We are pleased to introduce the Fashion Research Institute campus for fashion design education on the ScienceSim. The campus spreads across 9 regions, including the original historical build Shengri La™ Spirit. Fashion Research Institute’s “3-D website” is located at Shengri La Spirit 01, and incorporates a welcome center with an avatar customization salon and information about the Fashion Research Institute and its activities. We are particularly pleased with our ‘3D Website’ which has now been instantiated into two grids, IBM’s vBusiness grid and now the ScienceSim grid, both installations were performed flawlessly. Maintaining these two grid installations is remarkably easy, since the original region file is maintained on our private Fashionable Grid™. Changes to the region are seamless, with the region’s OAR file being uploaded to the various grids where it is present. Fashion Research Institute has also incorporated its Library of content creation tutorials and references into the campus. The Library is contained on its own region, Shengri La Spirit 02, and is currently hosting a fashion exhibit about Edwardian men’s neckwear. An array of art and design examples using virtual worlds are included in several other regions, which may be freely visited. An additional two regions are reserved for the upcoming Threading the Needle conference for fashion design students. Threading the Needle is the first ever virtual worlds-based fashion design conference, which is being presented for fashion design students to attend free of charge. Such notables as Fiona Jenvey, (CEO, Mudpie), Beth Harris (Director of Digital Learning, MOMA NYC), and Kerry Bannigan (CEO, Nolcha Fashion Week) will be presenting to students logging in from around the world. Fashion Research Institute’s campus for fashion design education may be freely visited in the ScienceSim grid, where all regions are publicly accessible. Simply log in and locate the Shengri La Spirit regions in the world map. Please note the spelling “Shengri La”, which is our trademarked region name which labels all of our regions in all grids. We would like to thank the Intel Corporation for hosting and hardware provided to Fashion Research Institute as part of our research collaboration with Intel Labs. We would also like to thank Mic Bowman and coworkers for their efforts in managing our OpenSim-based regions on the ScienceSim grid. We are pleased to continue our research into innovative methods for educating fashion designers for both the $1.7 trillion apparel industry and the emerging niche market of virtua designers.